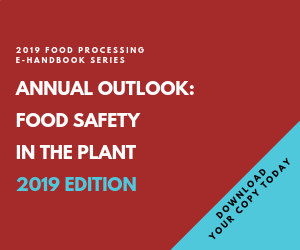 Food processors had a busy year in 2006, and our sixth annual Manufacturing Trends Survey shows it with some shuffling in the order of what keeps processors awake at night. It's no surprise that, with a growing economy, talk of minimum wage increases and the possibility of a 700-mile wall across our southern border, labor issues popped back to the second spot on the concern list. But food safety not only held onto its traditional top position, it increased its score. This year 47 percent of respondents name food safety their No.1 concern for the new year, up from an historic low of 30 percent last year (although we changed the scoring mechanism). The spate of natural disasters - primarily Hurricanes Katrina and Rita - reflected in the previous survey responses certainly made for an unusual 2005. But 2006 had its ripples, too, including several high-profile food safety scares, all traced back to fresh produce. Despite the threat of all-out global chaos and rising interest rates, the stock market climbed to record highs, energy prices dropped and things got back to something resembling business as usual. Overall business looks reasonably promising for the food industry in 2007. The snapshot we got from our respondents shows three in four processors expect total production to increase by at least 5 percent in 2007 (see graphic). That's about the same as 2006. Only three of those replying anticipate any decrease in production for the coming year. Next year's survey should prove interesting. Right before this year's survey closed, a stunning, across-the-board upset by the Democratic Party inverted the balance of power in the House, the Senate and state governorships for the first time in a dozen years. And two key issues of the elections - wages and immigration - likely will be engaged to very different ends under this new political power structure. In fact, during those historic elections, seven states passed their own minimum wage laws. One respondent puts it this way: "The new Congress will find it hard to tackle key issues such as immigration due to the (new) balance. This coupled with a push for higher minimum wages will only increase the labor pressures in the food industry." Click on the image to download charts of the 2007 Manufacturing Survey results (in PDF). We'll have to wait for the 2008 Manufacturing Trends Survey to see how all that shakes out. For now, here's what manufacturers had to say about how 2006 went for them, and what they are planning for 2007. Using a new statistical analysis for responses, we were able to get a clearer picture of processor concerns. We assigned weighted relevance to each of nine categories to determine level of importance. As you can see, food safety had no trouble maintaining its perennial No. 1 ranking: 47 percent of manufacturers mentioned it first for an aggregate score of 1,734. "With Taco Bell as a reminder, many of my food clients have elevated food safety in their business risk continuum," says Dexter Manning, national food and beverage industry leader at accounting and business advisory firm Grant Thornton LLP. "Many companies have augmented their internal operations audits with external food safety audits. I expect to see many more food companies develop specific, periodic food safety inspection programs to augment other company policies." Far and away the practice of choice for food safety involves the human element: employee training. Nearly nine out of 10 processors say it's on the agenda for 2007. Around half will employ hazard and critical control points (HACCP) plans, improve their pest control procedures and focus on more or improved sanitary equipment. Some noted how security measures will dovetail with food safety with respect to protecting against bioterrorism. Rapid microbial detection and other systems for detecting and/or eliminating microbes will be used by 28.6 and 19.8 percent of processors, respectively. Other processors also will go right to the sources, that is, make use of preferred, prequalified suppliers as another method of improving food safety. Another proactive measure mentioned was "rigorous risk analysis for any work that is not normal production activity." One processor is "adding a certified bacteria lab" and another is going all-out, installing "UV lights for evaporator ducts in (the) environment-controlled dry room" and is "looking into an 'Air-O-Care' system - a new product using corona charge and hydrogen peroxide." Look out, bugs! Concern for allergens was identical to last year, with just more than 82 percent dividing evenly along the curve of "somewhat" to "extremely" concerned. And, once again, about half (49.3 percent) chose "improved washdown/clean in place" as their primary method of allergen control. Detection and testing will be used by 28.6 percent and 22.1 percent are relying on dedicated lines as at least one method of control. Other concerns mentioned include expanding customer base, marketing, transportation issues, taxation and staying competitive in the market of ideas. Globalization also was an issue that has some processors worried. This included everything from competition from plants overseas (which have the advantage of cheaper labor costs) to sourcing ingredients from overseas markets to fluctuations in currency exchange. The globalization issue also raised concerns over regulatory issues with cross-border exchange of goods and ingredients. Regulatory concern wasn't just an international issue. Morphing domestic policies were an oft-mentioned concern in this non-ranked category - so much so that we'll likely include it in next year's list. Having conducted the survey during the closing weeks of a contentious election that saw immigration concerns shoved into the limelight might be one reason labor issues rose to the second position. Last year's survey was taken in the midst of an energy crisis, so it was no surprise energy came in second in our 2006 report. Since the energy situation didn't abate completely, the gap between second and third place was narrow (see graphic). Still, after food safety, labor is what's on everybody's mind - enough to bring it back up from its uncharacteristically low 2006 showing of fourth place, and back to where it was in our 2004 and 2005 polls. Some of this has to do with confidence in the food processing economy. Nearly half of respondents (43.7 percent) say they will increase their workforce, and another 35.3 percent will maintain the force they have in place. Of the 17.4 percent reducing the number of employees in their plants, about two-thirds (12.1 percent) will let nature take its course and do so by attrition. Within the subject of labor issues - which touched upon everything from illegal immigration to health insurance costs - "finding and keeping good workers" topped the list of pressing issues for 2007, mentioned by 42.1 percent of respondents. We added some nuances to this year's survey, delving deeper into the make-up of that workforce. Asking respondents to compare staffing levels with those of three years ago, answers were nearly identical for each of three broad job categories we specified: engineering, R&D and management (graphic). About one-quarter say staff for those groups was larger than in 2003, and about 45 percent report levels are the same. Staff reductions for those three job titles were markedly different. According to 14.2 percent of processors, engineering staff is smaller, only 8.9 percent saw R&D staff levels drop, yet nearly a quarter - 22.6 percent - say management staffing has declined. When we asked about salaries and benefits, only 7.4 percent say they will be cutting payroll. More than four in 10 (43.2 percent) plan on handing out raises in 2007. A solid 40 percent will keep those things status quo. Regarding labor, we asked the timely question, "How would stricter immigration laws/control affect your facility?" Whereas more than half (53.7 percent) claim "not at all," 36.9 percent say they will be at least somewhat impacted. One respondent echoes the sentiments of a number of processors by commenting, "Restrictions on immigration will reduce the available labor pool and make recruiting more difficult." "Food and beverage companies have historically had high turnover in some of the lower paid positions," says Grant Thornton's Manning. "The role of Hispanic workers in this industry continues to increase and may actually provide some stability at certain position levels." Several are worried by the possible combination of immigration restrictions and a jump in the minimum wage. As for wage issues in general, about 21 percent see wage increases - or just staying competitive within the supply-and-demand mechanics of keeping workers - as their main labor issue of the coming year. Not that all management begrudges laborers a fair wage. As one manufacturer replied, "We anticipate wage increases but we're not opposed to them. Our long-term planning has anticipated them." Energy woes may have been slightly less evident than last year, but energy costs are still high and processors know it - 42.6 percent report their energy costs went up more than expected compared to 2005; another 9.9 percent say "much more" than expected. In fact, 90.7 percent are "somewhat" to "very" worried about the cost of energy. Although less than 9 percent of processors were "severely" impacted by energy costs last year, almost three in four were moderately impacted - one company so much so it is "relocating to an area where the environment reduces energy costs." Because of the energy squeeze, two-thirds of processors are taking steps in energy conservation. One-third are conducting energy audits. Energy recycling through redirection is being employed by 22.2 percent, and 18.2 percent are seeking alternate energy sources. About 9 percent are looking at cogeneration. Interestingly, more than 28 percent are putting their mouth where their money is and negotiating with their energy providers (it never hurts to ask). Environmental concerns were big in 2006, too. Two-thirds of processors find environmental issues to be very, or even extremely, important. Almost a third say they are "aggressively recycling and/or reusing" resources. Almost half (47.5 percent) are recycling more than they did in 2005, and almost as many are recycling about the same amount. Stumbling blocks to recycling range from space and safety considerations to regulations and labor cost. But the majority of folks who want to recycle but can't cite the lack of companies willing to collect or purchase recyclable materials. All told, only 7 percent of processors responding say they are not recycling at all. So what are processors doing to go green? The standard "three Rs" of ecology - reduce, reuse, recycle - are on most manufacturers' playlists. We can add redesigning (packaging) and re-sourcing. Education campaigns figured big, as did cutting energy consumption. For the last word on going green, it's worth sharing one gung-ho processor's list of steps toward making an ecologically sound plant: "1. Wastewater treatment in-house to lighten load at city facility; 2. Using heated water from processing (previously thrown away) for other purposes; 3. Installed tankless water heaters for hot-water processes, replacing conventional tanks; 4. Replaced all overhead HID lights with Flourescent-5 fixtures; 5. Installed large air-storage tank, put in small air compressor." Security has lessened somewhat as a major concern - 32.8 percent say they are "very" or "extremely" concerned about bioterrorism or other terrorism compared to last year's 38 percent. And while 50.3 percent are at least "somewhat" concerned, 14.6 percent are unconcerned, slightly up from 2005's 13 percent. This could be a result of another year's distance from the attacks of September 11, 2001, or it could be the fact that 53.3 percent of those responding increased their security measures in 2006 as another 41.2 percent kept existing measures in place. Moreover, 45.2 percent report they are planning to increase plant security in 2007. Three respondents reduced security measures. The lock-and-key approach is still the preferred method of security at 67.5 percent for external access and 52.8 percent for restricting internal access too. Surveillance matched last year's numbers exactly at 54 percent. Look for more badges on and off the grounds as 58.4 percent of plants go to employee identification systems and 25.9 percent use outside security companies. When we asked about automation, consolidation and expansion last year, only 6 percent reported their entire plants were automated. Not that many more folks spent 2006 plugging in - this year the number rose only slightly, to 6.7 percent (see graphic). Other numbers stayed about the same, too: 54.5 percent automated production sections (56 percent last year), 53.1 percent automated packaging sections (53 percent last year) and 12.9 percent did logistics/warehousing (16 percent last year). Two subcategories in the automation area saw larger differences: Maintenance, repair & operations dropped almost in half, to 6.2 percent from 11, and automating the entire production line rose about 20 percent to 20.6 from 17. We added a subcategory this year, waste operations, and so discovered 6.7 percent of you have that section of your plants automated. How are you automating? PLC integration was the big winner at 47.4 percent, with custom software close behind, 42.1 percent. Off-the-shelf software accounts for 20.1 percent of automation methods. Robotics make up almost a quarter of automating (23.4 percent). PC centralization and RFID are nearly tied this year, 12 and 11.5 percent, respectively. Another new addition to this year's survey concerned the ANSI/ISA-88 batch processing standard. We asked how many processors knew of the standard: only 19.1 percent do, with less than half of them (7.7 percent) using it in any way. The standard is used as a way to define reference models and provide terminology for batch recipes and control in batch manufacturing plants. For 2007, 9.7 percent of processors plan to consolidate production or the number of manufacturing plants. More than 27 percent hope to expand and just under half - 48.1 percent - will keep things status quo. Roughly the same number of manufacturers report their capital spending budgets will stay the same (22.8 percent), go up 5-10 percent (20.4 percent) or increase by greater than 10 percent (22.3 percent). Just 7.3 percent believe capital expenditures will drop for the coming year. One company is going all-out, building "one new frozen-product manufacturing plant and expanding an existing frozen-product manufacturing plant to increase capacity 33-50 percent." In addition to building new facilities and overhauling existing ones, a number of manufacturers are planning to spend on new packaging equipment and packaging lines. Overall, this year's survey provided a valuable look at the issues moving the multibillion-dollar food industry forward. The editors of Food Processing thank all who took the time to complete the survey and who contributed comments. And don't forget, we're here for you - if you have any questions or feedback, write or call anytime.